Think positive! Spring is coming. The first thing I want to do is lighten up and throw off the heavy winter gear. 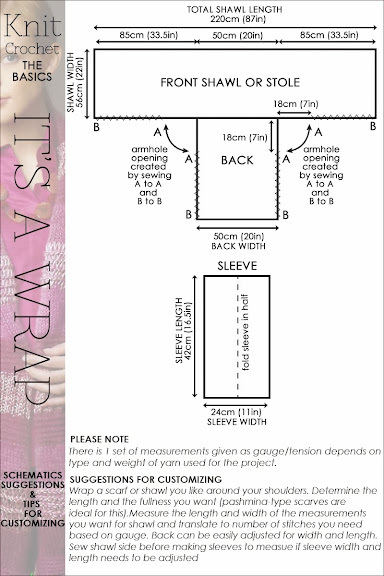 This is where shrugs, wraps and shawls can be the most basic and versatile garments you own. Throw one on and you're good to go. They wrap colour and texture around you and are totally cozy. A very popular past post featured a shawl collar shrug, made in 2 pieces with some shaping of the back piece. 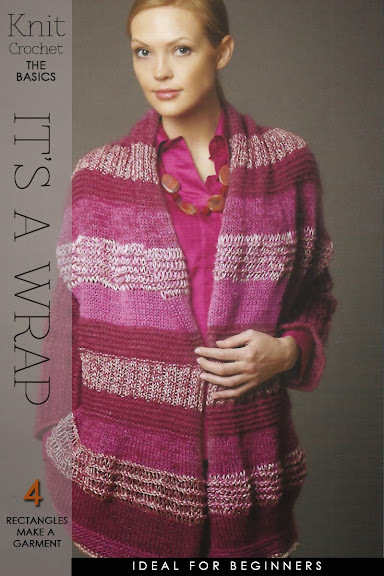 Just when you thought a design couldn't get easier, I came across one with 4 simple rectangles, the front shawl, a back and two sleeves. 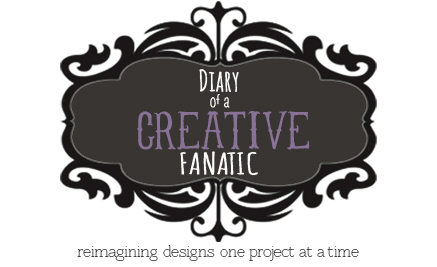 Go through all your past winter projects and overbuys (I have plenty!) 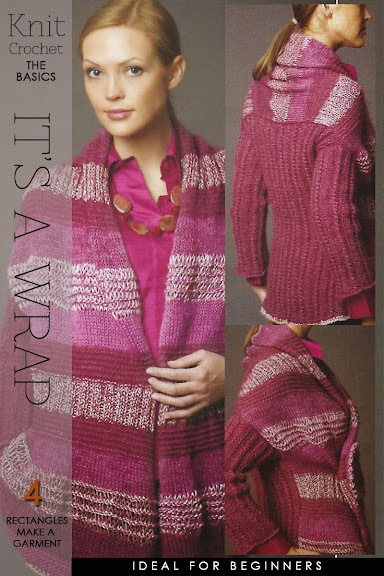 and use up all the bits and pieces for your front shawl. Pick up one or two of the colours for the sleeves and back. 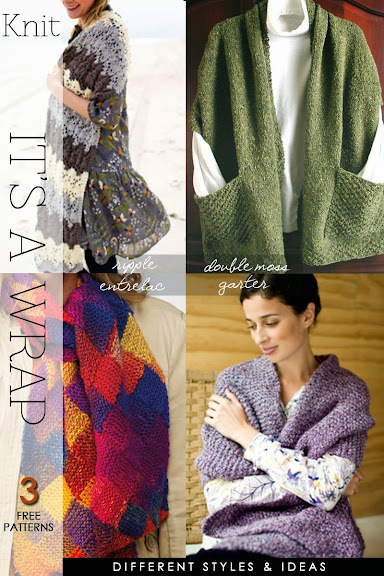 As I write this post, I'm already thinking of combinations that will work for my new wrap. 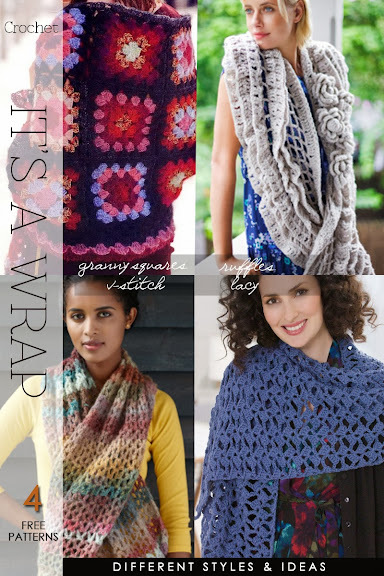 Read further to be inspired by more ideas and free patterns for both the knitter and crocheter. The 50's fashion was all about glamour and sophistication. There were all kinds of stoles that accessorized the outfit you were wearing. 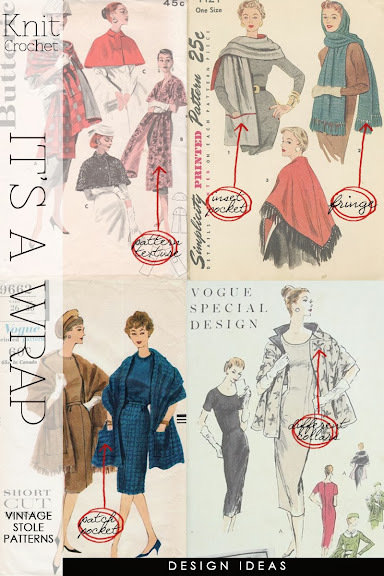 Some of these details can easily be added to any wrap you decide to make from the basic patch pocket to the notched collar, basically a split in the row on the inside edge of your shawl. Yarn mixing is another great way to add textural interest. Finer yarn made into a wider shawl resembling lace with a tweed back and sleeves, the two providing a visual contrast. Look at scarf patterns you like and double the width and work to desired length if the length specified in the pattern is too short.